This page provides information on various maps available for The Elder Scrolls IV: Oblivion and The Elder Scrolls IV: Shivering Isles. Local and interior maps with further zoom and higher detail can be found on the articles for each location in the game. Oblivion Satellite Map — UESP's own high resolution Cyrodiil map using the Google Maps API. Shivering Isles Satellite Map — UESP's own high resolution Shivering Isles map using the Google Maps API. 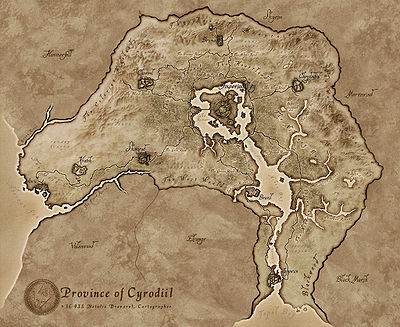 Cyrodiil roadmap — A map showing back roads as well as the major routes. These are the icons used on the in-game map. 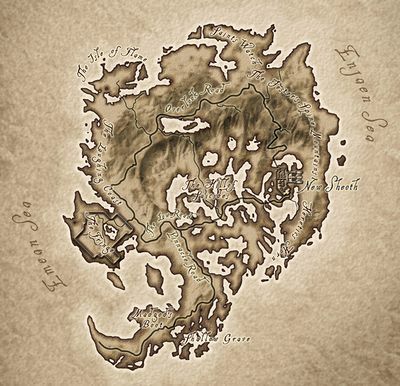 On the compass and map, dark brown locations are places you have previously visited (and therefore may fast travel to), and those in light brown are undiscovered. Icons are not displayed on the map unless you have either discovered them or they have been marked for you on the map. Unmarked Roads—Information about roads that are not marked on the in-game map. This page was last modified on 13 January 2019, at 12:59.